First let me say that this is quite distinct from a thread speculating about the differences in the map between AQW/DF and AQ/WF/MQ. In this thread, that difference does not matter, directly at least. My goal is to revive the old movement to make a map of Lore as it is in AdventureQuest. This is an old project that has been abandoned for some time. We have obtained new resources however, and I think we should pick back up and try again. I'm stickying this because I don't want this project to get lost, though if one of my fellow ArchKnights or Falerin feels that is due too much to bias, they may unsticky it. Cysero designed the continent when we were mapping out DragonFable. J6 redrew and colored it during his recent visit to the Lab. Llussion is currently coding the map which allows you to zoom into different regions. This means they share a map. This means that we pretty much know what DragonFable's map looks like, so we will be focusing on AdventureQuest. 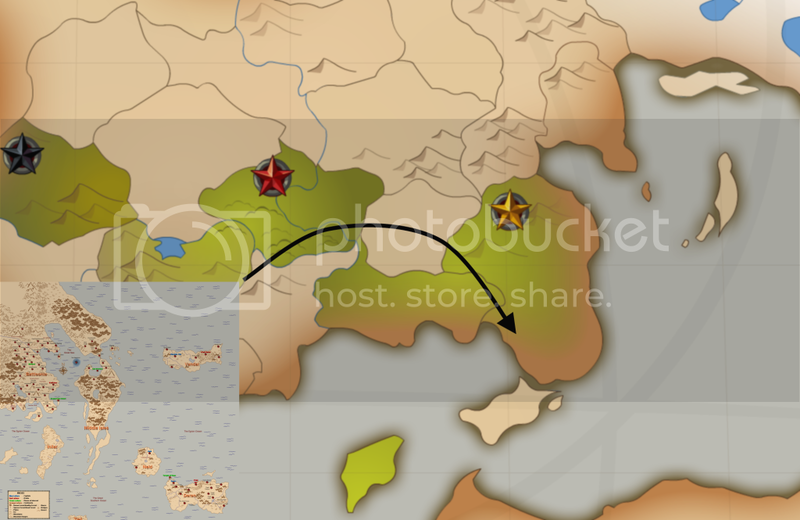 However, AdventureQuest's timeline still has DragonFable locations in its continuity, so at least some of them will still have to be placed on the map. So, let's make some maps. Maps of DF and AQW are unfortunately not helpful much at all. 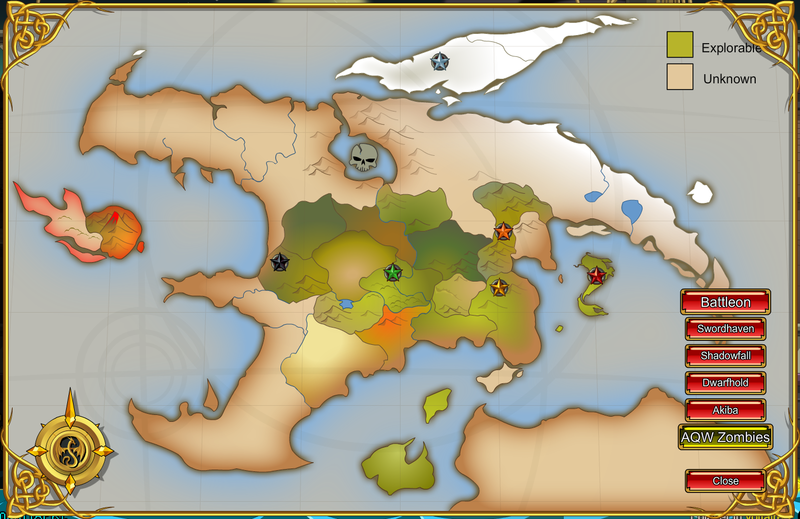 What we've seen of the northwest portion of Battleonia, the continent, in AQ does not match up at all with the DF/AQW map. 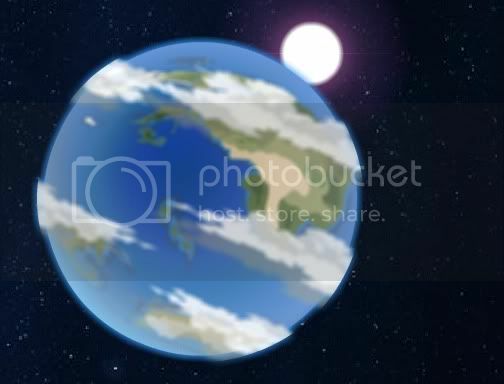 A different map was used for the planetary views in AQ and WarpForce, which establishes in the canon itself that the AQ/WF map and the DF/AQW map are different. The first step would be to dig out the old maps people were working on. They will provide some foundation to work from. The second step would be to take lots of screenshots from WarpForce. WarpForce have given us a new view of the planet. Let's not waste it. It's odd. In all the shots showing Lore from space, it is rotated 90 degrees counter clockwise. Additionally, WF appears to mirror the planet so that it is reversed from what it is in AQ and MQ. This gives us a glimpse of the western shores of the continent. I will be updating this first post as we get materials and maps. Comparing AQ and AQW; the peninsula north of Oaklore looks like the best geographical match for the AQ map, and indeed when looking at the Oaklore detailed map, you can see Lolosia at the tip of the peninsula, just as it is in AQ. The difference, aside from Battleon which has been moved, is Willow Creek - Its AQW location is far southwest of its AQ location. It would also appear that the island with Dark Jungle / Trophy Hunt / Dark Lands is missing from the AQW map. It's slightly larger than Greystar's. That bit of land that is "south" from it looks like Tjeli, but that is an odd place for it. It's too bad the Battleon area is obscured by clouds, but Inilar and the "Middle Isles" are easy enough to pick out. Another map from Greystar. You can see the region we can travel in AQ at the eastern corner of the continent, sadly covered by clouds. It appears as though Dragonclaw island flip flopped sides and is kinda close to Inilar now. (Or else it turned into Skull Punch island some how.) Vandar, Neld, and Deran got slid WAY up. They all appear to be the same, just shifted around a bit due to either continental drift or the timeline splits and mergings that caused their locations to move and bend. Actually it looks like Inilar became the northern horn of the dragon head for AQW... and if that doesn't show you how different the maps are, nothing will. The original look for Dragonclaw was somewhat similar to Skullpunch, so it very well might have become that. The horn of the dragon at its nose looks more like the newer one though. Please remember, we have a map for AQW. We're trying to make a map for AQ as that is one we don't have. ...though I suppose we can go back later and speculate the locations and shapes of the other continents for AQW... but that is another subject. This map estimates a lot of things and is inaccurate in the size and positions of the various land masses, but it is a good base to start from. Actually, this map was by ZAX, who was originally at the head of the cartography of the planet. He has since been banned though :P. I posted the map with his permission to keep the project alive. This is not entirely accurate. As some of you may know, I visited the Secret Underground Lab. 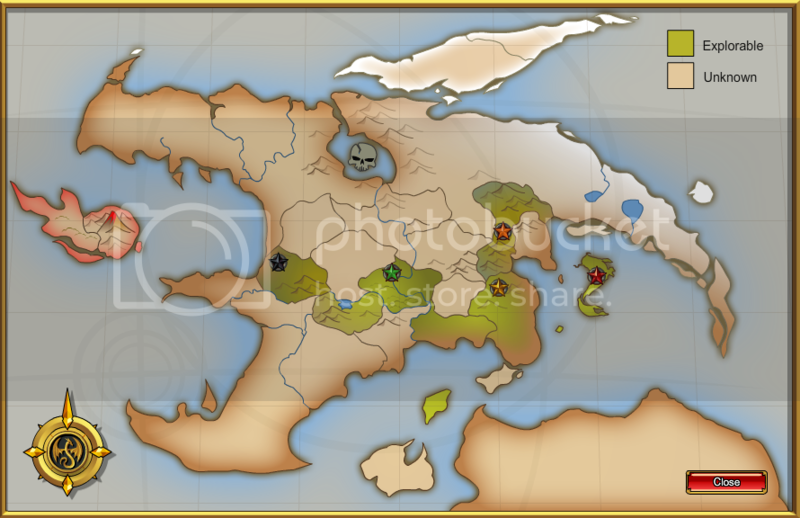 I asked Artix about the world map that he had talked about on the DF Design Notes so long ago and he opened a file of a continent that resembled a Dragon's head. At first, I was amazed. He explained some of the details of it to me while I asked some questions about it. There were two towns marked on this map - Falconreach and Battleon. Falconreach was clearly far to the West while Battleon was clearly far to the East. Artix explained that the original plan for DF (when the main plot was gonna be about trying to save the Guardian Towers from destruction) was to have the story continuously move you farther East along the continent until you finally reached the spot where Battleon would one day be formed. So, clearly, since Oaklore is near Falconreach, Oaklore should NOT be on the West side of the continent if we are referrencing the original Battleonia map in comparison to the current one. So the town locations of the DrgonFable region of the AQW map aren't accurate either? That would mean it is almost completely useless for this project. Also, for the WarpForce map, that patch of white (ish) in the south of the main continent is probably Skraeling. Unless I'm wrong, which I probably am. Clouds are covering where Skraeling would be. That sand looking part that we can actually see is likely the sand sea from the Falconreach region. I have noticed. On the old AQW map Battleon was to the east of Swordhaven but to the west of Shadowfall. This would mean that the old map was maybe upside down, and the fact that Battleon was so close to shadow fall before that it was close to it in the first place. I would then suggest that Battelon was originally here. I also think that if falconreach was to the west then it would have to sit close to shadow fall. But on DF when travelling to Falconreach west you cross a river. There is a river south of Shadow fall, so maybe Falconreach site south of Shadowfall past the river. Here is the link to the long map I put together. If someone could edit those together, it would be even more helpful. The original AQW map should not and can not be validly counted. It was called the incredibly inaccurate map of Lore for a reason. Also, the region it showed everything crammed into is the area that includes Battleon in AQ. It was even more zoomed in than those other region maps. As I said, it should not and can not be counted as a valid reference. I also put these maps together of how I think the maps merge. I think definitely on the AQW to WF you can see a possible match. Your second arrow from the right is pointing at Inilar, so that should tell you what's wrong about it. 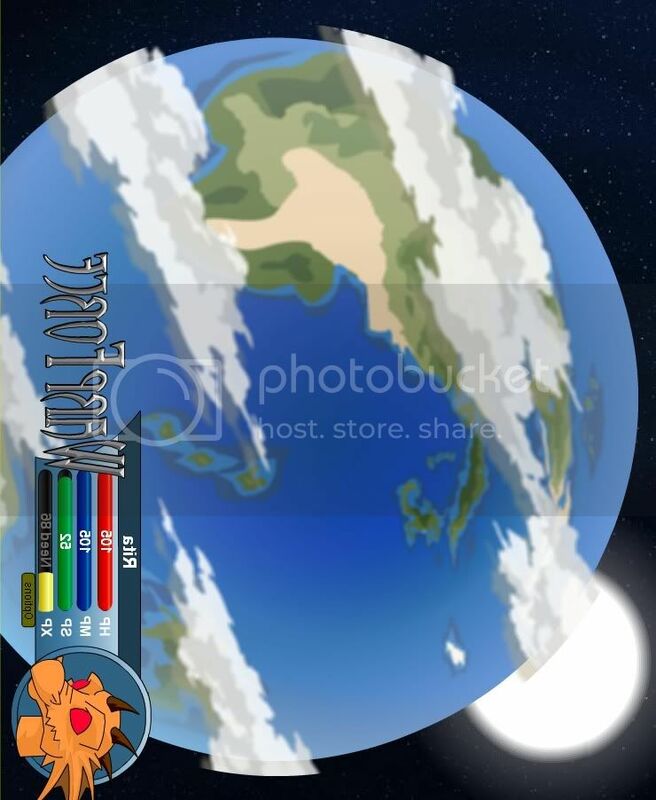 The larger horn on the AQW map is a part of the landmass with no water separating it. This is not so in AQ/MQ/WF. The clouds in that WF map are covering up the water between it and the rest of the continent and the Battleon coastline. The AQW map actually matches better when it is NOT rotated. The coastline becomes wrong when the map is rotated to make the larger horn fit and the larger horn is wrong when the map is not rotated. And again, I have to stress the last paragraph of my quote. AQW is TOO DIFFERENT to help us. 1. The official map of Battleonia has been changed since I first saw it (for all timelines). 2. Battleon is not quite as "far" East from Falconreach as we are led to believe in AQ and DF. Why must these be assumed? Well, the AQW map does not match up with the map I saw, if we take DF's in-game canon to be correct for all timelines. Falconreach is either in or East of Oaklore in DF. If we assume that AQW's map is true to all timelines, then Falconreach cannot be East of Oaklore, so it must be in it. This means, unlike the original Battleonia map I saw, it is not on the far West of the continent, but to the far East, very close to Battleon. If we still assume Battleon is to the East of Falconreach (which we should due to the recent canon information from the Fire War in DF), then Battleon must be in Oaklore, just barely to the East of Falconreach, if we use AQW's map (remember Battleon's current location in AQW is nowhere near where it used to be). If we hold AQW's map to be true for all games' timelines, then the entirety of Dragonspine, Skraeling Desert, the Fire Fields, and Grogh Swamplands must take place within Oaklore and the Neverglades, which doesn't seem quite right to me. So if we can't really rely on official maps, what about in-game scenery and dialogue? Can we walk the world of Lore with our character's feet? I know there was a project at one stage trying to do a scaled map of DF by the number of steps and screens between locations - I'm not talking about redoing that, but if you're walking along the south bank of a river and come across a town (or an (h)orc fort), but the map shows the town on the north bank of the river, which should you believe? I'd believe the physical evidence not the map. I don't really play AQ, but I'd love to help map the world of Lore. While discussing the map of Lore with Marrin (some of you may or may not be familiar with the person), he noticed something I believe the rest of us overlooked. In Orodalf's map, there is what I thought a small speck of cloud to the left near the V'eld. After Marrin insisted it is an island, I think I have to agree. He believes this could be Tjeli. It does look like the most frozen place on the map. Could it be? It does have a peculiar brown and blue border around it that none of the other clouds seem to have, but which the land masses DO have. I wish they hadn't turned off the cloud animations; when WF first started the clouds kind of swirled around, that would have been an instant indicator of whether that speck was an island or not. As for whether it's actually Tjeli... it does seem to be in the right place with relation to Inilar. But what is that chunk of islands off the coast of Inilar? Sorry it's kinda dark. I didn't get to snag a screenshot until it started fading to black. You can see what I believe to be Neld at the edge of the planet above the middle isles (if we assume the WF screenshots are flipped). Probably not much help though. EDIT: I figured out what we were looking at in the asteroid shoot. The little hook-shaped piece of land near the left gun turret is just a part of the Middle Isles. So there's nothing new in that screenshot. To add on to what the True Assassin was saying about Falconreach being near Shadowfall, perhaps Shadowfall IS Falconreach. Falconreach lay abandoned and the Dracolich fell on it. Edit: Also, I don't think the AQW world map is the whole thing. For one, the south pole doesn't line up and for two, it has latitude and longitude lines. Assuming that these are 15 degrees apart like on a regular globe, there would have to be a huge amount more to the world than what is shown there, assuming, of course, that the north and south poles are both 90 degrees like on earth. You want us to sneak into the Cap and rescue him? Oh. You aren't joking. You're crazy! The AQW map does not match the maps of AQ, WF, and MQ, and so it is not something we can rely on. 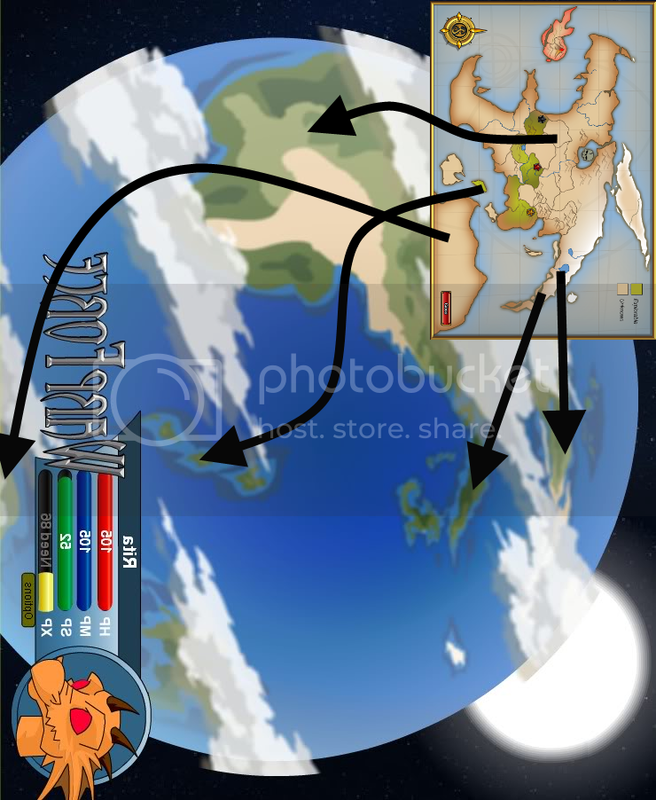 Likewise, we cannot be certain any of the landmasses from those three games will be the same in AQW. The maps are fairly incompatible. Considering that, this is more of an effort to finish the AQ "Travel Map" to include the rest of the world. There is too little information to try that for the DF and AQW maps. Great news! I come bearing concrete evidence regarding that little white speck on Orodalf's map! This is from the beginning of the Shearhide cutscene. There's definitely an island on the far right of this image to the "south" of Inilar. The shape matches perfectly too! Also, I still have access to the super old map of LORE, would that come in handy here or has it been rendered pretty much obsolete? PS: Hey Cheddar, do you still maintain contact with ZAX? I wonder how he built his map and whether it was a Photoshop file. We should probably start recompiling and updating it to match new information we find. For example, based on the WF screens we've captured it looks as though Tjeli is a bit closer to Inilar, and the shape is slightly different. There's also a bunch of islands off the west coast of Inilar that don't match the current map compilation. If ZAX still has access to his map files, we can update it. We can also try to just update his PNG file but it'd be easier if it was a PSD or some other format with layers. Looking at these two pictures (Courtesy of Lkeas), there seems to be something a bit off. These two pictures are rather obviously of the same place. However, I don't think it's possible to obtain a reflection l;ike this through rotation. So either some deviation of light happens at some point and reverses one of the two pictures (although I have no idea if that would even be possible), one of the two is actually of a parallel Lore, or one of the two picture got reversed and it's more of a minor bug than anything else. Yeah... I think it's more that the artists don't worry too much about the geography and just slap in the "world o' LORE" planet whichever direction they feel like when making the cutscenes. And I mean, most of the players won't notice anyway, so I don't blame them. They've got tight deadlines and have more important things to worry about than which direction island #3 is facing. The original appearances of it in WF were mirrored. Perhaps they've been better about making sure it is the right way around in the later quests. I do wish they'd go back and fix the earlier appearances... I'm 97% sure those were a slip up. That first image is the correct one. Rotate it 90 degrees clockwise and you'll have the AQ travel map (and then some).